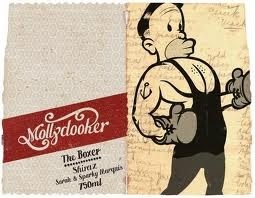 When we first tried the 2009 Mollydooker “The Boxer” Shiraz, it packed a punch. In fact, it knocked our socks off. However, the “Mollydooker Shake,” an effective form of “instant aeration,” takes a bit of courage! These vintners do the Shake with most of their red wines that are young (less than two years old) and WOW, does it ever make a difference. Next time you open a very young red, try it. Mollydooker is Aussie for left-handed, by the way. The husband-and-wife-run winery is sponsoring a contest to name their newest release. Find out the details here. September 4 is the deadline. This entry was posted in Australia, Tips. Bookmark the permalink.